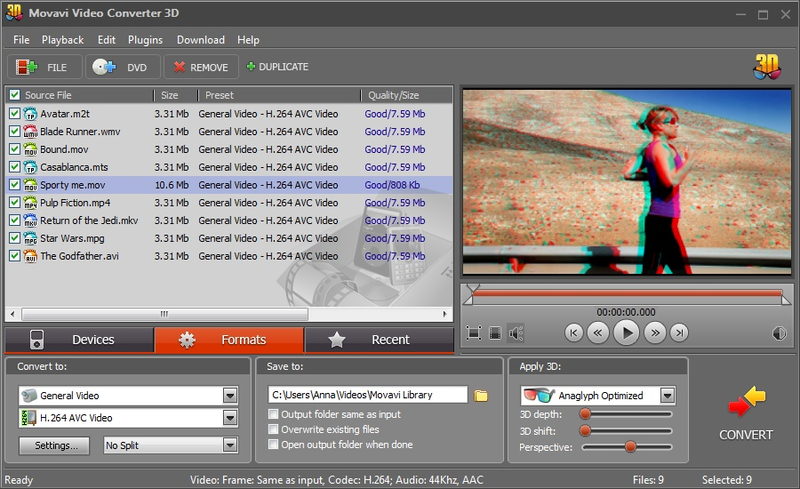 Movavi Video Converter 3D - Convert 2D to 3D: movies, clips and DVDs. With Movavi's revolutionary 3D video converter you will get immersed in 3D without breaking the bank buying expansive 3D movies and camcorders. Here's what it has to offer: - Convert 2D to 3D. - Instant preview of 3D output. - HD-video ready. - Support of polarization glasses, shutter technology (NVIDIA), and anaglyph 3D glasses. - Support of 3D TVs, NVIDIA 3D Vision Glasses Kit, and 120 Hz displays. - Ready-made predefined settings for various devices and the web (iPad, YouTube, PlayStation PS3, Xbox 360 etc). - Batch file processing. - Automatic brightness feature. - 3D depth and shift effect adjustment. - CPU acceleration on 2010 Intel Core processors. - GPU acceleration with NVIDIA CUDA (encoding only).